Below are some of the common questions we receive about our software. If you’re wanting to learn more about how to use SignCommand, we recommend starting with our video tutorials. Why are my graphics/text blurry or pixelated in the preview or on my sign? Please note that the SignCommand software makes your playlist appear larger on your computer monitor to make it easier to work with, which may result in fuzzy or blurry lines. If you are concerned about blurriness during preview or within the slide thumbnail images, test your message on the sign itself to see if the issue appears there as well. Because the sign will display the playlist at its native resolution, it will show better than on your computer monitor. If you still experience blurriness on the sign, continue with the following information. The amount of detail a sign can show (known as its resolution) depends on the amount of physical pixels within the LED display. This is determined at the time of purchase, and is not a function of the software. The preview feature within SignCommand simulates what your playlist will look like at your sign’s resolution. To create clear, readable text on any sign, please see our video tutorial on using pixel text within your playlist. For tips on how to better show images and video clips on your sign, please see our article on how to optimize graphics on your LED sign. Why do I receive “There was an error sending your playlist to the sign”? If you receive this error when sending or downloading a playlist, please duplicate your entire playlist using the “Copy” button on the main playlist screen. Then send or download the copied playlist. You may delete the original playlist after confirming that the copy works correctly. Why are my temperature slides being skipped? If your sign is skipping temperature slides, it may require a software update. Please see our instructions on applying a software update to the sign to ensure you have the most recent version. If your sign software is up-to-date, please continue with the following instructions. The sign is offline. Check that your sign is online within the Signs page of SignCommand. If not, follow the Offline Sign Help instructions to bring your sign back online. The connection is being blocked by a proxy server, firewall or other network appliance. Part of the network may be blocking the communication. Check with your network administrator that all subdomains of signcommand.com (*.signcommand.com) are reachable from the network. In particular, if you use a Barracuda Web Security Gateway, ensure that weather-service.signcommand.com is allowed with an SSL/TLS connection. The weather service is offline. While very unlikely, the weather service may be down. This issue would be resolved in a matter of minutes or hours, so wait to see if the service resumes. If not, it is most likely one of the two issues above. Once the sign can reach the weather service, normal operation will be resumed. There is no need to resend your playlist. If this does not resolve your issue, please contact support. 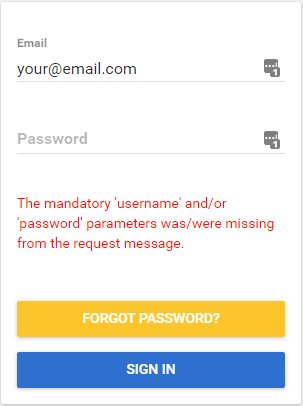 How do I add or remove a user for my SignCommand account? If your user account has been set up as an “Organizational Administrator”, you will see an Admin section in the left navigation. Select this and then Users to add, edit and remove users within your organization. If you do not have an Admin section in the left navigation, please contact the user within your organization that has these permissions. They may add and remove users for you, or set your user account to have this level of access. If no one in your organization is set as the Organizational Administrator, please use our contact support form to request this change. To protect your account, upgrading a user is performed by our Support Department after verifying your identity. Does the software support languages other than English? Yes! We support the use of many different languages, both within our user interface and when typing a sign message. See our Multi-Language Support page for more information. What media file formats can I upload and use on my sign? Why can’t I access or view the SignCommand application? SignCommand requires a modern web browser to work correctly. If you are experiencing problems viewing or using the SignCommand application, please ensure that you have updated your browser to the latest version. See our list of supported web browsers. How do I prepare for a technical support call? If you have a scheduled call with a technical support representative, please follow these instructions in advance of the call so that we may more quickly assist you. Be near the sign site and at a computer that has internet access. Retrieve your sign’s diagnostic information and have it available to email to the technician. If there is a visible issue with the sign such as a problem with an LED board, have digital photos available to email to the technician. Know the location of your sign’s circuit breaker or other power disconnect switch. What is required to use SignCommand? Please see our full list of software, network and hardware requirements on our Requirements page. Network administrators or other IT professionals may also wish to review our Technical Specifications. How do I set the date, time or timezone on my sign with a USB drive? Using a text editing program such as WordPad, create a new plain-text file. A full list of valid timezone values can be found here. Save the text file with a name of time.txt in the root folder of an empty USB drive. At the time you specified above, plug the USB drive into your sign’s external USB port. This will update your sign’s clock, and your new date and time will show automatically. However, if you entered a timezone you will need to turn your sign off and back on for the new settings to take effect. Why is the date or time incorrect on my sign? By default, signs are set to retrieve the official date and time from an internet time source on a regular basis. This should prevent your sign from drifting out of sync with official time, or when the time changes as with Daylight Saving Time. However, this requires that the correct timezone information is set on your sign. If you are seeing an incorrect current date or time, follow the instructions to update the time on your sign with a USB drive and specify your correct timezone. Please note that signs that are not connected to the internet will not be able to automatically retrieve official date and time information. For these signs, you must update the time via USB drive for time changes. Why is the temperature incorrect on my sign? We use industry-leading online weather services to retrieve the current temperature information for your area. Please note that current temperature information may take up to 10 minutes to be shown on your sign. If the temperature on your sign is significantly different from other sources, this may mean that we have the wrong zipcode listed for your sign. Please contact support to correct the issue. 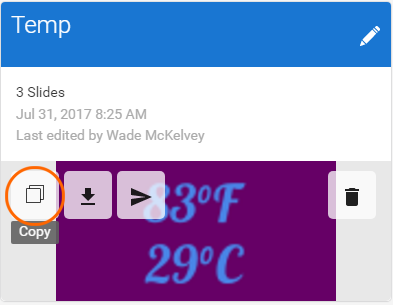 If the temperature slide is being skipped entirely, please see the page on skipped temperature slides. How do I apply a software update to my sign? Updating your sign’s software manually is not recommended unless directed by a support technician or from an error code solution. How to determine if your sign has a software update available. Follow the instructions to retrieve your sign’s diagnostic information. Within the text file, look for the dates listed after the lines starting with Player Version and Player Patch. Compare those dates with the dates listed on the Files & Downloads page. If there are newer versions available for either file, you may proceed to manually update your sign. How to update your sign’s software manually. Download an upgrade from the Files & Downloads page. The file’s name will end with .upgrade. Place the downloaded .upgrade file onto an empty USB drive. Plug the USB drive into the USB port on your sign (if equipped). When the sign’s display goes completely black, the sign is rebooting. You may then remove the USB drive. Your sign is now updated. Be sure to remove the .upgrade file from the USB drive before using it again. How do I get my sign’s diagnostic information (SignInfo)? With your sign turned on, plug an empty USB drive into the external USB port on the sign (if equipped). Leave the drive in the sign until you see a message on the sign indicating that it is ready to be removed. This will download all of your sign’s diagnostic information to the drive into a text file named signinfo.txt. Plug the USB drive into your computer and open the signinfo.txt file on the drive by double-clicking on it. Why is my sign offline? If your sign hasn’t connected to the internet in a while, an “Offline” indicator will appear next to it. Don’t worry! This is usually a result of a temporary connection problem between your sign and the internet. During this time, you won’t be able to control or see the status of your sign remotely. However, SignCommand signs are designed to continue functioning without being able to connect to the internet. Your sign is capable of showing the existing playlist, including all scheduled slides, without an internet connection. As long as there is power at the sign, most likely your current message is continuing to play. If your sign does not resume normal operation, see our Offline Sign Help page for a full troubleshooting guide. How do I receive product support for SignCommand? If you are an existing user of SignCommand, you may receive support by completing the Contact Support form or Self-Schedule for Customer Support. Can I use SignCommand with my existing LED sign? SignCommand is only available on signs with compatible hardware. If you already have a sign, speak with your sign provider to find out if your sign is compatible. How do I sign up for SignCommand? SignCommand is only available on signs with compatible hardware. If you already have a sign, speak with your sign provider to find out if your sign is compatible. If you don’t yet have a sign, contact us to be put in touch with a sign provider for your area. How much does SignCommand cost? SignCommand is only available through our authorized sign dealers. Please speak with your sign hardware provider to see if SignCommand is available for your sign.